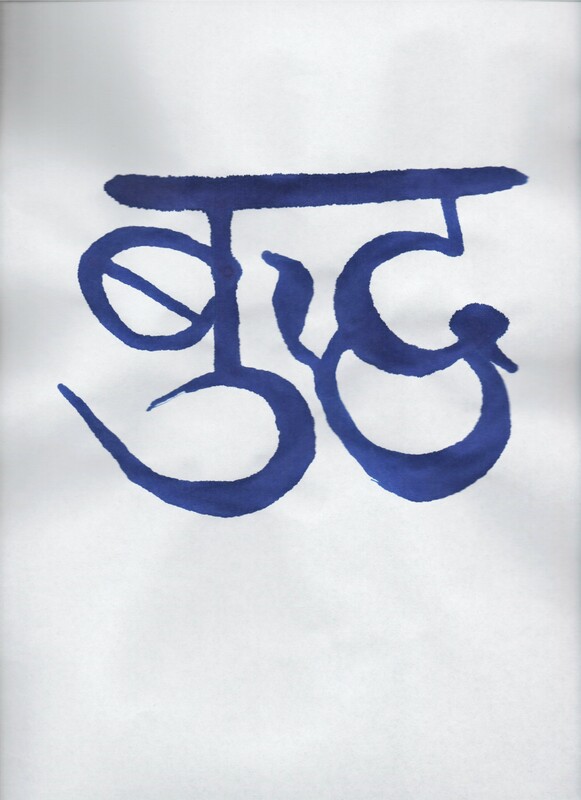 The Sanskrit word “Buddha” is rendered in blue lightfast, permanent ink with traditional sumi brush on rice paper. Usually reserved for Kanji, the Zen style of calligraphy calls for the calligrapher to empty his mind and become a vessel for the universal life force or chi to flow through him, guiding him as he renders his work. This process imbues the work with vital energy. This piece is aprox 9×12 and is the perfect addition to your yoga space, meditation area, home or office. The word Buddha means “awakened one” or “the enlightened one”. “Buddha” is also used as a title for the first awakened being in a Yuga era. In most Buddhist traditions, Siddhartha Gautama is regarded as the Supreme Buddha (Pali sammāsambuddha, Sanskrit samyaksaṃbuddha) of the present age.Gautama taught a Middle Way between sensual indulgence and the severe asceticism found in the śramaṇa movement common in his region. He later taught throughout regions of eastern India such as Magadha and Kosala. Gautama Buddha, also known as Siddhārtha Gautama, Shakyamuni, or simply the Buddha, was a sage on whose teachings Buddhism was founded. He is believed to have lived and taught mostly in the eastern part of the Indian subcontinent sometime between the sixth and fourth centuries BCE. Previous post: October Art Walk!